I Ran Out of Vases! I thought there was going to be a big rainstorm, so I harvested something like 35 of them over the course of the weekend. 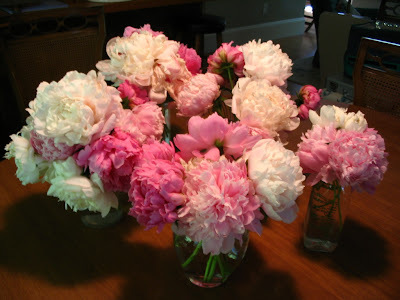 I guess you could rightly call this a peony explosion, since the biggest, poofiest ones are called "bombs." Since I'm smackdab in the middle of deer tick country, the creepy crawly critters are never off my mind when I'm in the garden. Have you noticed how birds are constantly looking around for predators even while eating at the feeder? Or how chipmunks stand tall to look around every 2 seconds, to be sure they are safe? That's about the level of my tick paranoia. It's my high priority to avoid any future bouts of Lyme and courses of antibiotics. I guess if this were my highest priority, I'd give up going in the yard. But I could never do that. I'm not being brave; I just have to go out and garden. Period. Here's my regimen: first line of defense, dress properly. I never garden in any other clothes but long sleeve white t-shirt, little boys' chinos [size 16, made sturdy for getting dirty], white socks pulled over the pant hems, rubber muck shoes. I live dangerously by not wearing a hat. [By the way, it is nearly impossible to buy long athletic socks, now that only the biggest geek goes around in anything but those peds tennis sock things. No socks are IN, but in tick areas, that's courting with a bite.] Then spray DEET insect repellant on shoes, socks, pants, sleeves, neck and hands. Phew! Horrid. But necessary. Next, I go to the garage for my yard-dragging flannel. This is a piece of white flannel blanket, about a yard wide, and long, that I stapled to a simple bamboo garden stake. I then made a very long looping handle by stapling a long lenghth of garden twine at each end of the bamboo. I then place this flattened out on the ground, and drag it along the grass as I walk toward the flower bed. Then I drag it all around the grass surrounding the flower bed. Turn it over and look for ticks: this not only brushes some of them off the grass so they don't get on me, but I can guage how infested the area is by taking this sample. [I saw scientists doing this on TV years ago when the Lyme scare first hit the news.] EEEEE. When I catch the ticks, I whip out my handy roll of scotch tape, and press the tape onto the ticks, then fold the tape over to trap them, suffocate them, and generally remove them from threatening me. I am never without the tape in my pocket, and it's my first defense if I see a tick crawling on me. This is rare if I am as careful as I can be. To begin gardening, I then spread my trusty garden tarp over the grass at the edge of the flowerbed where I'm going to work. Spray repellant on the edges. Then kneel on this to do my gardening. Instead of accumulating weeds and garden debris to take to my compost pile, I now fling each handful of garden refuse, dispersing it over the lawn, to be chopped up by the next lawn mow. Only for a big big load of garden detritus do I venture down the mown path through the tall weeds to my composting area. I realize I have to relocate my pile, or I'll never use it regularly again! When I went up to the pile earlier this spring, a tick got me, and got attached, and I didn't find it for a couple of days, because it was on my back. Too gross for words! So I'm quite off the compost at the moment. I stop and look at my legs, arms, back of my ankles, any part of me I can see, every few minutes. Just like the little birdies and chipmunks, I'm constantly checking if something is coming to get me. It's a bore, but consider the alternative...more doxycycline! When I come in for the day, I peel down, check myself with the help of a hand mirror and my significant other, then dash to the shower, then wash my garden clothes. The end of another day at the frontlines of the tick war. I know I sound crazy! But the ticks are itsy-bitsy, teensy-weensy, and even the larger ones are to be avoided too, so I now just consider all these defensive actions normal. Shorts and barefoot in the grass? Well, apart from the fact that I turn 55 this month and my legs aren't so good, this won't be happening for me anymore! At least until we have a cold, cold winter again, that will kill off this teeming tick population. What tick tricks have I missed ? Someone told me to put rubber bands at the cuffs of my sleeves, but that would be so uncomfortable. Maybe after my next dose of Lyme bacteria, I'll see that trick differently. 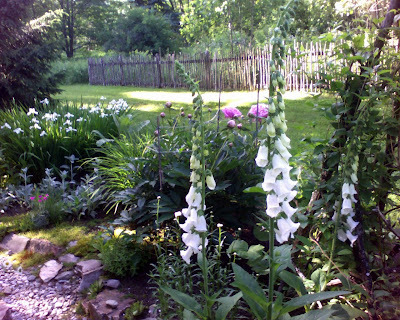 Believe it or not, I still love my garden! Those little buggers aren't going to get me to give up gardening without a fight. Now, what about that bear that is supposedly roaming around the region? That's another post entirely, involving clanging saucepans. 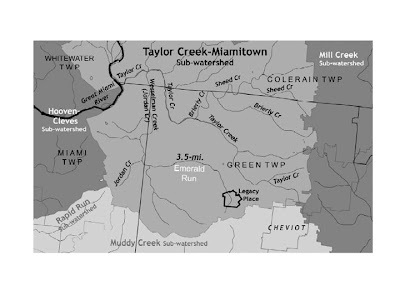 This is a map of the stream systems in Green township, in suburban Cincinnati, where I grew up. Back in my days there, there were lots of fields, woods and open spaces. We could hear bobwhites calling, we regularly raised baby birds, bunnies, and found box turtles everywhere. Those days are long gone. Since I left home in 1970, the fields and woods have been filled up with tract houses. Whenever I visit my mom, another memory is shot to pieces as I see another open space swallowed up by sprawl. The last big tract that managaed to stay development-free was finally spotted by an evil, greedy smalltime Donald Trump who assembled enough parcels to propose building "Legacy Place" mall. The footprint of the mall and its surrounding land falls right behind where my mother still lives. I'm against development in general, but this seems all the more egregious because in the very immediate vicinity of this site are empty, abandoned stores in two large strip malls. The whole project is completely unneeded, and the population just won't support more commerce. There is a group fighting the Green Township trustees, the developer and all the lawyers, and they are trying very hard to slow down or stop this project. They've now arrived at the stage of demonstrating the harm to streams and wildlife on this piece of land. And there would be harm, to put it mildly! [ Obliteration, I think, could be considered harm! ] To that end, this group, called "Safe, Clean Green," sponsored a contest to name a stream on the property that appears on the official maps, but is unnamed. My ironic name suggestion, "Emerald Run, " was selected. It's hard to be a protestor from 1000 miles away, but this was both fun and gratifying! The name will be submitted to be entered onto the official maps and records of the area. Neat-o. Doesn't this look like an Old Master's painting? 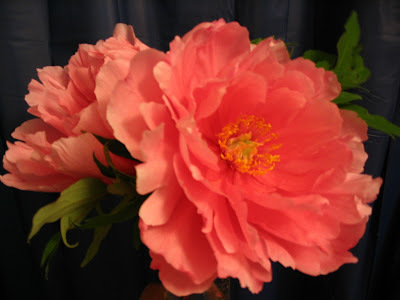 My tree peony has never thrived; in fact, it is a virtual stick struggling to grow in the clay, but it provides the most amazing flowers. Not dinner-plate sized, but close! The pink is to die for, though the photo makes it look too orange.